Let us take care of the heavy lifting for you. Our professional mounting and finishing service will ensure your custom design is secure and safely applied to any surface or structure. We use various adhesives for many different types of applications for temporary or permanent placements. Our experienced professionals trim and pre-mask all designs for easy, quick installation. We also laminate over the graphic to ensure durability and protection for your custom design. 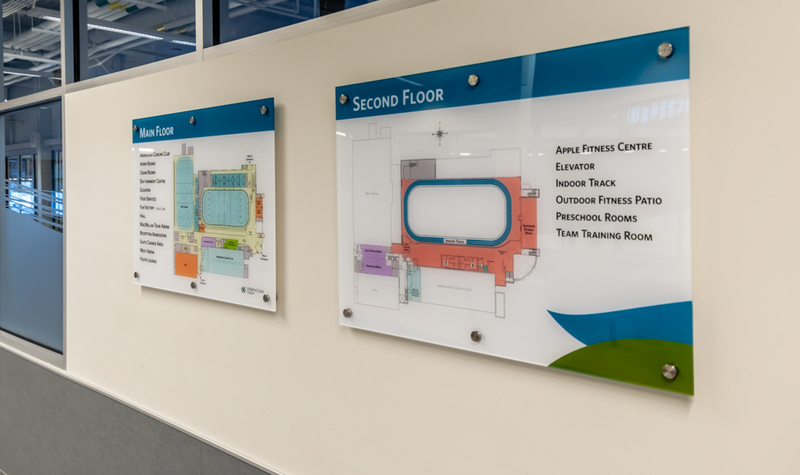 The team at Ardrossan Rec Centre contacted us to help them produce some way-finding signage for their facility. Their needs included front facing standoff signage as well as hanging signage. As glossy as they are informative these signs catch your attention in a good way, and help the customer find their way around the facility quickly and efficiently.